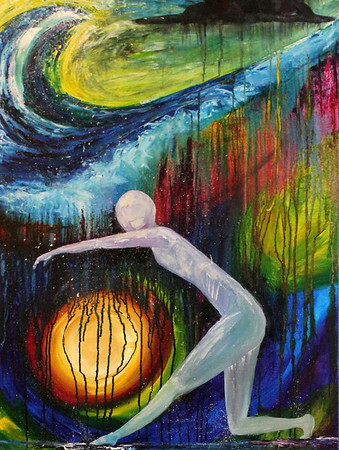 This painting is an illustration of focusing on the power of Love at work in our lives. There are so many opportunities for believers to be overcome by disappointment and despair when we lose track of the Hope we are promised when we walk with Christ. Even amidst our troubles the light of God shines brightly and we need to open our eyes and look for Him. He is there, waiting to remind you of your place in His hands and heart. Part of this beauty we can share in is being a force of powerful Love. Once we have our own foundation of Hope we are called to be contagious with it in one another's lives. Like a tidal wave or a wildfire it is not easily stopped. It runs its course and consumes all in its path, sweeping away all that was and leaving a new beginning behind.